BJ The Kid Chicago has made his way onto the radar of soul and R&B fans around the world over the past year. To the surprise of many, this young artist from Chicago has been in the industry for a while, writing for some of the biggest names in music while at the same time fine-tuning his craft–in anticipation of his own opportunity, which finally came. I had the pleasure of catching up with him and he was very eager to enlighten EARMILK readers about his past and what he has planned for the future. EARMILK: To start things off, walk us through how you initially got involved in music, and how you settled on your particular sound. BJ the Chicago Kid: I was a writer at first, I was growing as an artist but being a songwriter is what moved quickly and kinda put me in the right circles with the right artists and, you know, just moving from there. My choice of sound from the beginning kind of reminds me of what made me fall in love with music in the first place. Soulful music has a gospel feel to it which I found at church, but Monday through Saturday I was hanging out with the guys on the block doing everything else that we be doing (laughs) that comes with the block so that’s where I get my aggression and my content. I'm a fan of good lyrics and pushing forward for better-sounding music. EM: Would we recognize anyone you've written for? BJ: Absolutely! I wrote "I Want To Be", "Love of My Life", "Ridiculous" for Musiq Soulchild, "Hurt Again" for Mary J. Blige, "Impossible" with Kanye West, Keyshia Cole featuring myself. It's been a hell of a ride, but a ride that allowed me to take notes and to prepare for my time. EM: Your music is very soulful, a sound that seems to be missing from music currently. What is it about R&B and soul music that you think people gravitate towards? BJ: I think people can tell that it's true, not necessarily the story but where I come from, the place I'm singing from. It’s an earnest place, it's an earnest soul, I feel like my life is always attached to my music. Not necessary lyrically, just what I'm going through has always let me express myself musically better. Even singing live, you can tell, like, eh, that boy done lived (laughs). He done lived, he done cried, he done seen some things. EM: Coming from Chicago, did gang life play any part in your life? Most kids would want to be a rapper coming out of the inner streets. What steered you to R&B? BJ: The best way for me to explain that is hip-hop itself isn’t about selling drugs or women or other words that they are called, Tribe wasn’t about that, Common wasn’t about that, Joey Bada$$ wasn’t about that, Kendrick Lamar wasn’t about that and he grew up in the hood, he's telling you. Like, I grew up in the midst of all this, but I'm still true to who I am. If you stay true to who you are, the fans are going to feel that. I remember Jay said no one can tell your story better than you because you’re telling it. So if you stay true to yourself people will support you 'til the wheels fall off. EM: You recently signed to Motown Records. How does it feel to sign to such a legendary label, most notably Michael Jackson's label throughout his career? BJ: It's an honor to be a part of such a legendary label. I'm going to live up to it, but I'm not going to live in it. A lot of people have crazy, crazy stories to go with the music but I want to be a regular person and live my life and make my music. I think the people around me, my family and my friends, will definitely keep me grounded. EM: Complex placed Pineapple Now Laters on the top 50 albums of 2012 list. What does that mean to you and were you surprised to see it on the list? BJ: I was honored to just be considered on that list with hip-hop acts and incredible indie acts. It was an honor just to be mentioned in that group, it wasn’t even 100 people! This was before Motown and before everything, this caused the labels to look at what I was doing. This project was very selfish–what I mean is that we weren’t listening to the radio at the time and what others were doing. That’s why some songs are only a minute and a half long, because we felt that what we could say in three minutes could be said in a minute and a half. If you want more play it again, it's that simple (laughs). We are trying to bring the art back into the game. Everything is different, everything has its own individuality, that is what my crew is providing and that is what my friends in the industry are providing. We understand that music changes like the world changes so we’re here to make that happen a bit faster. We are trying to bring the art back into the game. EM: Kendrick Lamar is arguably noted as the most lyrical rapper currently in music, and he was featured on two songs on your project. Can you tell me how that connection came about? Did Kendrick give you any advice? Do's or don'ts of the industry? BJ: What's crazy is we have been fam for years like years, before when he was Dot, when he had a little haircut (laughs). I met him and J-Rock and everyone else all on the same day, way before the world knew them as TDE. We been fam for a long time so just to grow with him has been an honor. To have him on two records, I felt like it's what fit the album at the time. There were a bunch of other songs that didn’t fit the album. It's an honor for him to work with me as it was to work with him. We also made stuff for Good kid M.A.A.D City that didn’t make the album, but I'm actually happy because that stuff we made is bound to come out. So when it does, it'll help what we are working on at that time. EM: Seeing as we are an online publication, can you speak about the importance social media has played in your career? Do you think you would be in the same position without it? BJ: Oh man, the internet has changed the way we create music to a point where I could create music in this car while I drive right now. Social media is very necessary, some people see it as an evil, but I feel that it is a necessary evil. It's kind of like a photographer, so you taking my picture right. You can only work with what I give you, if I give you an ugly pose you can put a nice tree behind it but it's still an ugly pose. So it's all based on what you give them. You can only work with what I give you. 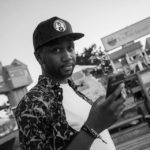 EM: What does the next year have in store for BJ The Chicago Kid? Any ventures outside of music? BJ: I'm trying to finish this album of course. Expect me to be in a lot of different cities, we got shows everywhere. Expect more BJ in your ears and your eyes because I feel like there is nowhere in the world that we are not going to take advantage of. We have a great opportunity with Motown. EM: For those that are only hearing about you for first time after they read this interview, what is one thing you want them to take away from their introduction to you and your music? BJ: Just know that good music still lives in Chicago, I'm living proof that anything can happen just believe and follow suit. Once you believe you have to follow suit. That’s all you need.